Whats the deal with the Trojan War, anyways? In the English speaking world, Homer is probably second only to Shakespeare for pure gravitas in any mention. Homer has become a part of our culture, a shared language of poetic allusion to inform any discussion. But was there actually a Trojan War? Did the Heroes really stand and fight and die at Ilium? WTF is Ilium anyhow? When one begins to look into this absolute mess of literary tradition, one discovers that a lot has been written on it, much of it contradictory, most of it apocryphal. For example, it is claimed that ‘Homer’ did not in fact exist, and that the entire thing was written by a completely different guy who happened to be named Homer. A great deal of ink is spilled arguing such minutia, which I will not bother to repeat here. Here it is merely my intention to cut through the overgrowth and get to the basics, which will mostly involve my choosing between various strands of long traditions. There is a great tradition in preliterate societies of people being able to carry a massive amount of information in their heads. The recitation of huge passages of epic tales is common, in fact de rigeur in almost every society in the world that does not possess a strong written tradition. . An interesting feature of these Oral Traditions is that the entire passage can in fact be memorized without error. This has now been proven substantially in widely surveyed surviving traditions such as the Irish Celtictradition in which their ‘bards’ can still recite long passages of old epics. They use various tricks and mnemonics to achieve these feats of memory. 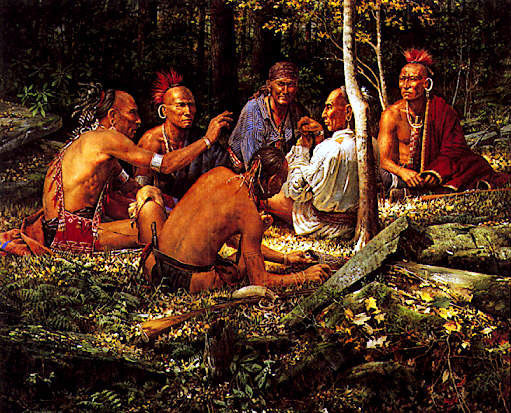 Oral poems, or passages based on oral tradition, tend to be highly repetitive, rhythmic and highly patterned. Poetry, it turns out, has a special place in human tradition in that it was our trick to remember long strands of data. The poetic form is usually the earliest form available because it is the form in which people were able to memorize the work. It is due to this long Oral Tradition, which was very strongly present in the Greek society, that we owe such a long preservation of the Homeric Epics. It is in part due to this preservation ability of poetry that we are able to be reasonably certain that at least part of the Epics legacy dates back to roughly the time they claim to speak of. Homer was faithfully repeating what he heard, and what the hearer heard, down through the ages. There are other techniques too, which scholars use to date material. One of these is word choice. In the Homeric Epics, there is much talk of Bronze Age technology, whereas the Greeks were well into the Iron Age when the poems were finally written down (and frozen forever). Archaeology then not being nearly what it is today, any authors creating new passages would have unconsciously included mostly iron age references. Likewise, cities and lands are mentioned in the Bronze Age epics which had long since ceased to be inhabited by the Iron Age. In fact, MOST of the information in the Iliad (Homers work on the Trojan War) should have been lost because after the Trojan war (as we shall see) the Greeks lost a great deal of their culture and aspects of civilization. So, we can be reasonably certain that at very least the story itself dates back in its kernel form to the events it purports to describe. Much of the information scholars can glean about the Trojan war places the actual event at around the 12th Century B.C.E., or perhaps in 1250 B.C.E. if we believe Herodotus (there are worse mistakes one could make than believing Herodotus, The father of History). And it was probably fought not as a battle to save a petulant princess as Homer describes (every good story needs a princess in distress?) but rather as a trade war against a power that was blocking the expansion of a Greek Empire. The City of Ilium sat near the modern day Bosporus in Asia Minor, the passage between the Aegean sea (that of the Greeks) and the Black Sea. The areas to the north of the Black Sea held a lot of trade value that the Greeks would have wanted access too. In fact we find records of their actively trading with the northern Black Sea area. 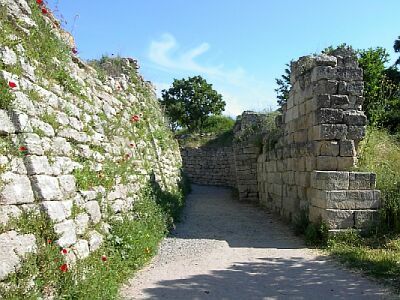 Ilium, called Troy, was a Hittite outpost that guarded the passage way and probably either extracted a large toll, or prevented Greek seafaring traders from going there altogether. The primary Greek Kingdom at this time was known as Mycenae. They had, some time previously, cast off the shackles of another Kingdom (based in Crete) and were expanding in power and trade all along the coasts of the Aegean Sea. 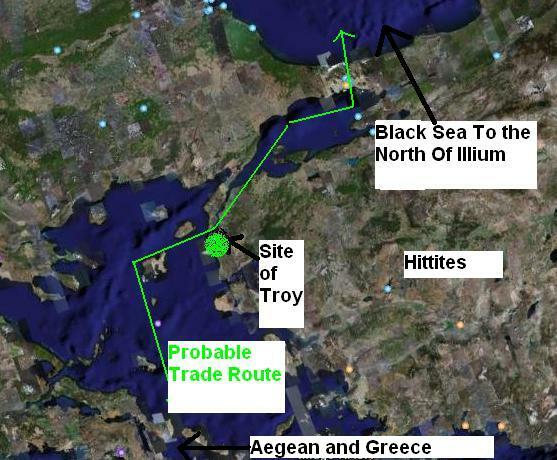 As the above map demonstrates, the only trade route through the narrow passage in the north of modern day Turkey was directly past Troy (also known as Ilias or Ilium). It becomes necessary then, for further expansion, for the Mycenaeansto get through to the rich trade lands in what is now the Crimea of Russia. There are other echoes of this Greek desire to trade in the north, recorded in mythical form in the Epic of Jason and the Argonauts, who go searching for the golden fleece (rich wool trade) in the same area. The Trojan War was probably fought for economic purposes, not for the dramatic one used by Homer to build a story. When Heinrich Schliemann, a man recognized widely as the Father of modern Archaeology, went looking for the historic Troy, he used Homers Epic as his guide. He was looking for a massive, well defended city situated at or close to the narrows. 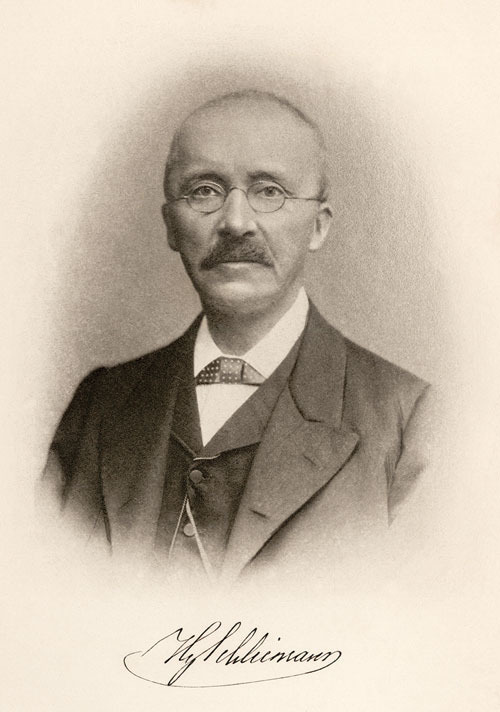 Schliemann could not have found his city, however, were it not for the (again oral) traditions of the people in the area. When asked where Troy was, they pointed him towards a giant hill that was somewhat further inland than one would expect. It turns out that the coastline had gone out quite a bit since the time of the Trojan war, mostly due to deposition of soil over the centuries. Nevertheless it was there, right where tradition said it would be. Schliemann, who was basically making up archaeology as he went along, managed to slice right THROUGH most of the layers of Troy including the one we now suspect as being contemporary to the Trojan War story. In finding Troy, he managed to destroy much of it. It turns out that there had been and continued to be continuous occupation of the site for quite a long time. Sites dated from before Homeric Troy, straight through the Greek period and into the Romans. The last occupation of the site was a Roman town, also named Ilium. The site seems to have been routinely sacked, at various points in its history. A fate not uncommon for a rich city. Schliemann discovered not one, but many Troys built on top of each other. In discovering them, he managed to wreck much of the city he was looking for. The aftermath of the Trojan war was not kind to the people of Mycenae, or to Greeks in general. It would seem from records (Homer himself records huge tallies of the number of ships and supplies each Greek Kingdom sent to aid the cause) that the Greeks over extended themselves. Immediately after the fall of Troy (a war that took many years to completely, the Greek kingdoms begin to fall into disrepair. A vast dark age begins to settle over the once prosperous Greeks. A dark age so deep that they actually forget how to write, ceased living in cities, and almost (except for homer) forget that the whole thing happened at all. A blackness fell on western civilization (at the time, the Greeks were pretty much it).There are Egyptian, and some Greek, records of raider sea barbarians ravishing the Mediterranean at this time. Some scholars have suggested that these “sea people” are the dispossessed Greeks, seeking treasure as their home cities collapse under the economic strain of a long and unproductive war. Luckily for them, and for the west in general, many centuries later the Greeks managed to pull themselves out of this collapse and ignite a new torch for civilization. The period before the Greek Dark Age is usually referred to as Archaic Greece, the period after is the Classical when much of what we now think of as Greece became fruitful. In the later, Classical period, was Periclean Athens, the works of the great philosophers, and the eventual writing down of the surviving Homeric Epics. It is interesting to note that what we have of the Homeric Epics is not the complete ‘set’. Much was lost and either not written down, or did not survive. As far as ‘written down’ goes, the Greeks were the only known people to have invented a written language twice. The second time at the beginning of the classical period. The Mycenaeans, for their efforts, were eventually conquered and enslaved by the Spartans. The Spartans being a tribe of Doric Greeks who had survived during the dark ages in the hinterlands of Greece and finally invaded the now crumbled remains of an ancient Mycenaean Kingdom, whose Oral Epics they then began to venerate and call their own. Sparta then, centuries later, itself fell to an even more backwater cities inspired by the Greeks to Empire, the Romans. And so it goes. Although they eventually sacked the city, the War with Troy proved to be too much for the fledgling Greek Kingdoms, and they fell into catastrophic decline.